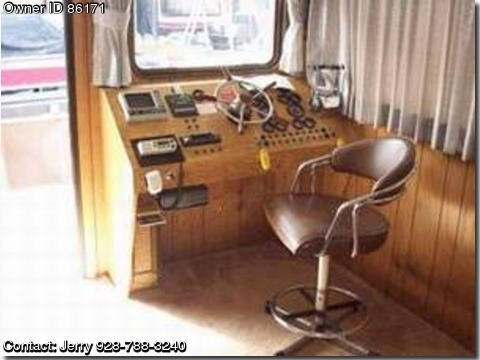 1985--MASTERFAB....... 56' HOUSEBOAT INCLUDING SLIP #W 12 AT KATHERINE LANDING, BULLHEAD CITY, AZ.LIKE A CONDO ON THE WATER. 2 V-6 CHEV I/O ENGINES, 11KW WESTERBEKE GENERATOR, KINGSIZE BED, TV, 2 BATHROOM, OAK CABINETS, ICE MAKER, 2 AIR COND. UNITS, 2 FRIG, 19 GAL ELEC WATER HEATER, FREEZER, PLENTY CLOSET AND PANTRY SPACE. SOFA MAKES INTO QUEENSIZE BED, PLUSH CARPET THRUOUT, BBQ.